For some reason, this last purchase did not work. Great flea med for my cats. It does not harm my cat and it works great. It kills fleas in their tracks. This product is no longer an effective remedy for fleas on cats. Did not seem to work on our cats -- still getting fleas . This product has FAILED IN EVERY WAY To be effective with my cat. I have had to work with her alone groooming, feeding 24/7 at times. Product is good and arrives in the mail quickly. Product is effective and efficient. Frontline the best for my cats. 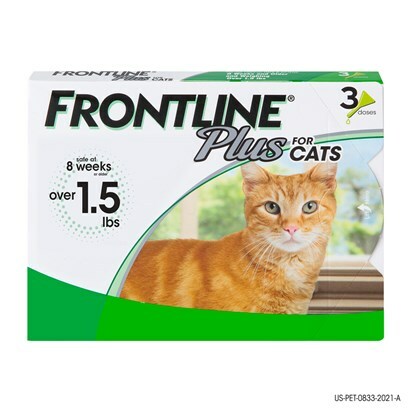 Have used frontline plus for cats for quite a few years. Product didn't work at all! It did not work for a long time so I stopped using it. This product is the best. I know my vet recommends it. My order was shipped quick. ?? not sure what is happening? Was not at all effective. I can't think of anything that would make this product even better. Seems to do what it's supposed to do! This is product I had to switch to after advantage due to 1 of my cats having crf. It may cost a little more than advantage, but is very effective.